Mobile phones are now essential for the vast majority of us. They are great at streaming music, playing videos, retrieving emails, linking us via social media to the rest of the world and a myriad of other apps take care of our lives. But whilst they are vital to us, they often appear to consume battery power with alarming speed. We all know the frustration of your phone dying just as you need to make that important call or reply to that message. With all the services and apps typically running in the background, it’s no wonder your device can rapidly run out of juice. Streaming music uses more of your phone’s battery than playing tracks stored locally on your phone. If the streaming music service you use offers and offline mode (like Spotify for example), then consider using this. If you download the music to your phone you’ll then be able to listen even when there’s no Internet connection and you will be saving battery power too. If you’re running iOS 8 or higher, there’s a feature called Battery Usages that shows you which apps have been sucking the most power over both the last 24 hours and the last 7 days. Check out which app is draining your power and underneath each item you might see a comment providing you with more details on why the app has used so much battery and gives you recommendations for ways to fix it. More power is required to listen to music via the iPhone’s internal speaker or a wireless setup. If you use your headphones / earbuds you will reduce the amount of power needed. This is perhaps the biggest drain of them all. You can simply turn down your screen’s brightness and you will find that this reduces the battery consumptions quite quickly. The iPhone has an ambient light sensors that adjusts the brightness of the screen based on the light around it. That makes is darker in dark places yet brighter when there’s more ambient light. This can help to save some battery power and if you turn on auto-brightness you’ll save energy because your screen will use less power when you are in brighter environments. Bluetooth unnecessarily drains your battery if you’re not using it for anything so check out if you need it for linking your wireless headphones and consider turning it off. . If you are listening to music on your phone you don’t really need Wi-Fi. If you don’t need the Internet then you might as well temporarily disable this battery drainer. This feature is enabled by default for sharing files and can be used to transfer music to another device. However, it also uses battery power while running in the background so consider turning it off. Watching videos from sites like YouTube usually involves streaming. If you can download the music video instead, then this will save quite a bit of power. This feature is great to EQ the audio on your iPhone, but it uses more power than you’d think. If you don’t need to change the settings this could save you some battery juice. Disabling this automatic service will save power which you can put to better use. Were you aware that Background App Refresh is using battery power in the background getting your apps ready to use them. This feature looks at the apps you use most often, the time of day that you use them, and then automatically updates them for you so that the next time you open the app, the latest information is waiting for you. Whilst it is a really useful feature, it also consumes battery so consider a manual update and you will save some power for later in the day. Suggested Apps, introduced in iOS 8, use your location information to figure out where you are and determines which apps (either installed on your phone or available to download in the App Store) might be useful to you based on that information. Great for sales for the App Store and developer; not so good for your battery life so if you need to conserve power, switch it off in the Notification centre. This only applies if you use your phone’s personal hotspot to share your wireless data connection with other devices. 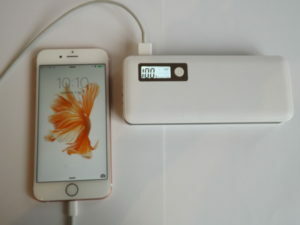 Personal Hotspot turns your iPhone into a wireless hotspot that can be a really feature, but as you might guess, it also really pulls a lot of power from your battery. Obviously when you use the tool it is necessary but if you forget to turn it off when you are finished your battery is being drained un-necessarily. One of the coolest features of many phones is the inbuilt GPS system. It gives your phone the information it needs to know where you are and then give you directions, locality details based on that. But, like any service that sends data over a live network, it needs a lot of battery power to work. If you’re not using Location Services and you need to save battery, turn them off and save some power.